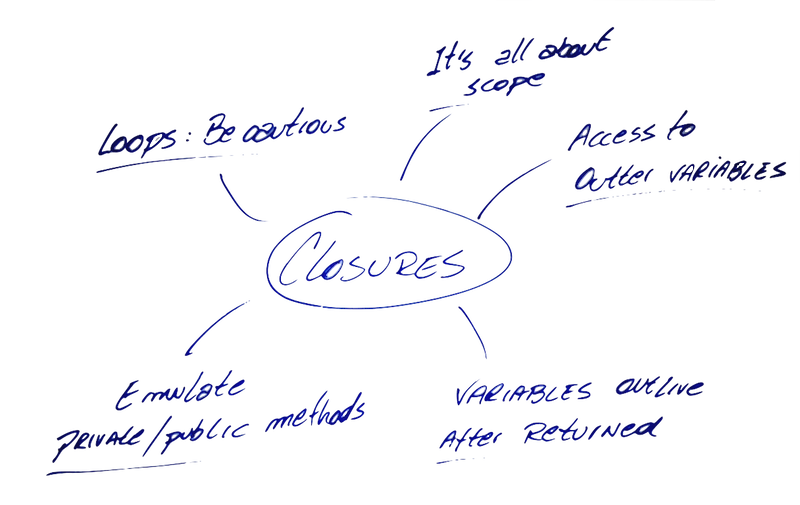 Have you always heard about closures but never knew clearly how it works? Don't worry, closures is not a complex concept to learn if you break it down into small parts as I'm doing here. What I usually do to keep things in my mind for good is to sketch up a mind map. Yep, a mind map like this one above that has the central subject in the middle and several branches off it. Each branch is a small part of the central subject and this drawing you see is similar to how our brain store information, therefore, it's a great way to study things. After this small introduction to mind maps, let's start with this interesting subject: closures. First of all, what's a closure? In simple words, closure is the scope created by a function which encloses variables and other functions creating a separate "environment". Look at the code below, this is an example of closure. Yes, a simple function called myClosure() with a local variable a defined in it and a var a declared outside the my function. Note that when we execute that code below, the variable a inside the function is protected from the outside, because myClosure function is enclosing the the local variable. So, this is a closure. Nothing so fancy, right? Yes, nothing fancy in this example but further on we'll have some better ones. Remember the mind map in the beginning of the article? Now we'll go through each of the branches with a bit of examples and notes. This item says that we can access all outter variables by reference from within our closure. So, let's demonstrate it by incrementing the previous code including an inner function inside myClosure(). myClosure(); // output: "inside" "another outside"
myClosure(); // output: "inside" "hey"
Note that inner() has access to all outter variables (a and b) by reference, it means if we change the value of b for example, inner() will automatically get the new value. That's a pretty exciting use of closures, check this another example and an interesting use of it. In the code below, when myConcat() is executed it returns a function enclosed in a scope, prefix is also enclosed. With that in mind, sayWelcomeTo and sayByeTo are two closures with different environment from each other. This example above shows us that closures keep the state of variables when the function was defined. To make it more clear, look at the screenshot below showing how you can easily see the closure scope and local scope when debugging in Chrome. The closure keeps the value "Welcome" from the time it was created. 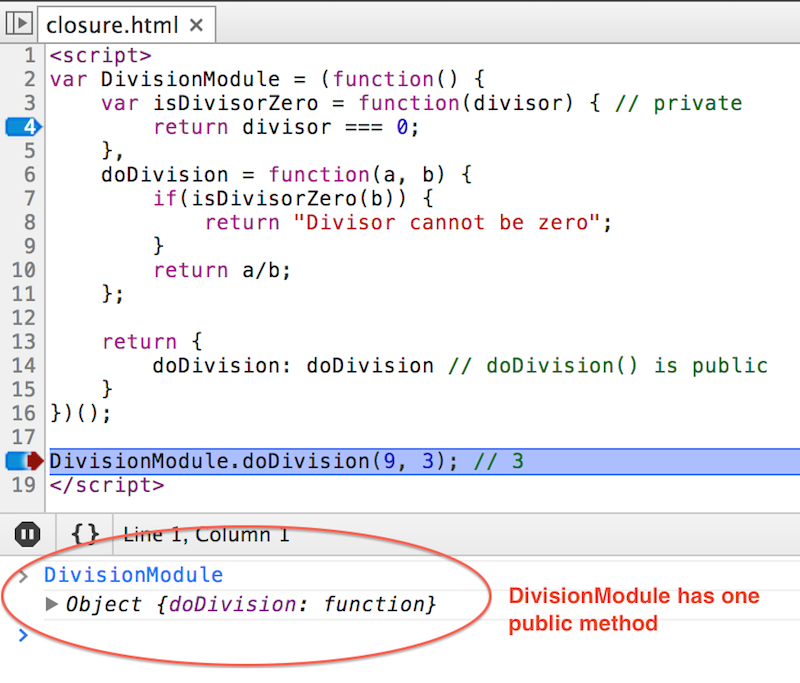 In the example above isDivisorZero() is a private method because it's not in the return statement. See below how we exposed just the doDivision() method, everything else is private. // This notation below makes the function be immediately executed and a closure is created. 4. Closure and Loops: Caution here! Always remember that closures keep the reference of outter variables instead of value. This piece of advice can be particularly important in loops with closures because if you don't take that into account, something like this can happens. The code above was meant to show an alert box with the colour that was clicked on. But instead what we get here is an undefined, do you know why? Because the alert() is using the variable i by reference and by the time we click on any link the variable i will have the value 3 for all the links. The value of the variable position will be the same when the function was created. P.S. I used mind maps for the first time when I was studing for an SAP Netweaver Java Certification, which was a subject totally obscure to me at the time. That map was much bigger than this one from this article. If you're intested in seeing it, let me know in the comments and I can show you. P.P.S. If you like this post, don't forget to join my mailing list below to receive future posts in your inbox. I'll never share your email address or spam you.